Little is known about Moses Glover. He is recorded as baptised at Dunstable, Bedfordshire on 26 October 1601, the son of John Glover. 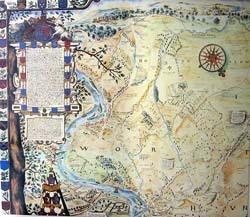 He was the creator of the enormous survey map of the Isleworth Hundred made for the Earl of Northumberland in 1635. The map is kept at Sion House. Glover described himself as paynter And Architectur on his map. In a marriage licence issued by the Bishop of London on 22 September 1622 he was described as a painter-stainer of Isleworth. He married Juliana Gulliver, also of Isleworth, widow of Richard Gulliver, painter. The marriage was to take place at St Botolph's, Aldersgate, London. Two of their children were buried at All Saints Church Isleworth between 1625 and 1628.